We propose a new visual servo approach to automatically control in real-time the full motion of a 2D ultrasound (US) probe held by a medical robot in order to reach a desired image of motionless soft tissue object in B-mode ultrasound imaging. Combinations of image moments of the observed object cross-section are used as feedback information in the visual control scheme. These visual features are extracted in real-time from the US image thanks to a fast image segmentation method. Simulations performed with a static US volume containing an egg-shaped object, and ex-vivo experiments using a robotized US probe that interacts with a motionless rabbit heart immersed in water, show the validity of this new approach and its robustness to different perturbations. This method shows promise for a variety of US-guided medical interventions that require real-time servoing. 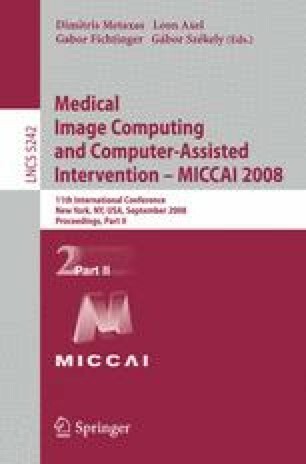 Electronic supplementary material is available for this chapter ( 10.1007/978-3-540-85990-1_41).